hd00:221950s: Paper with Habeus Corpus written on it. Paper with Subpoena written on it. Teenage boy in classroom talks while students around him read. sd01:361970s: A woman with a cervix tumor is diagnosed by a radiation therapist after he performs some examinations in 1970.
sd01:281940s: Black men sing about poverty and working for the man in American in this 1940s soundie musical. 4k00:231940s: Salesman plugs in vacuum cleaner. Salesman speaks to woman. Salesman pours sand on carpet. hd00:241950s: Boy and girl sit in diner booth and speak. Boy and girl nod heads. Boy responds. Boys talk to one another. Girl speaks. Boy responds cautiously. 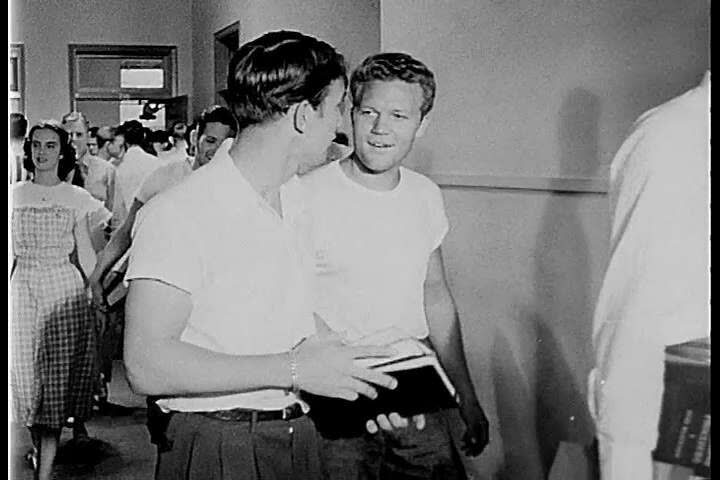 sd00:311950s: A student drinks from a water fountain while his friend offers to be his campaign manager after a poor speech at a school election assembly in the 1950s.